Whether you go grand and planned or just fill a modest bed with your favorite edibles, there’s really no reason not to have an herb garden. Trust us. Your tastebuds will thank you. Starting an herb garden, I discovered somewhat by chance, is a gift to yourself that keeps on giving. As a chef and cookbook author, I used plenty of herbs – my vegetable garden had an oregano plant here, a thyme plant there. But while they were always appreciated, they were haphazard at best. When I was asked to teach a class about growing and cooking with herbs, I knew I needed to step up my game. I viewed some gardens online and visited a few local herb gardens. I also reflected on how to personalize it based on my interests. The result: a circular bed in the middle of my vegetable garden, divided into four specialized sections – culinary herbs, tea herbs, cocktail herbs, and medicinal herbs. Inside the circle, I placed a small outdoor table and a few chairs. To start the culinary section, I replanted sections of oregano, thyme, and chives from elsewhere in my yard. Mermaid Farm in Chilmark was selling mini herb plants for fifty cents apiece, so I picked up four baby dill plants, one Thai basil, and a summer savory, which I love paired with summer green beans. Total cost: $3. The bounty began in the spring and early summer, when I snipped thyme, mint, basil, oregano, or dill. But I was also experimenting with some more unusual herbs, including lovage and lemongrass. Later, blue borage blossoms and bright yellow-orange calendula flowers, and eventually lavender and multi-colored nasturtium blooms, created an artistic toolbox for the kitchen. Used in both catering jobs and for pure home enjoyment, these gorgeous edible flowers, torn into petals or used whole, brightened everything from appetizers to salads and desserts. Catherine’s Favorite (Most Used) Herbs: Borage (edible flowers), Calendula (edible flowers), Mint, Oregano, Parsley, Chives, Lemon verbena, Cilantro, Thyme, and Basil. As I picked and garnished, I kept a sheet on the refrigerator, noting each time I picked an herb or flower and the dish in which it was used. An herb butter with chives, tarragon, parsley, and lemon zest for fish. A fresh lemonade with lemon verbena, lemon thyme, and mint, garnished with flowers. Gazpacho enlivened with chives and basil. Local lamb kofta on skewers with mint and parsley. Herbal water with citrus, mint, and lemongrass. By the end of July, I had added six sheets. The variety meant there was something for every meal. As late as Thanksgiving I not only still had parsley, sage, thyme, and rosemary with which to scent my stuffing and holiday dishes, but also still out there ready for use were fragrant lemongrass, edible flowers, chives, mint, oregano, cilantro, lemon verbena, and even a few precious basil leaves. I was familiar with kitchen herbs, but I had no idea what to plant in the medicinal section. Vineyard herbalistand author Holly Bellebuono gave me surplus sections of anise hyssop, catnip, and bee balm from her own garden – candidates for both the medicinal and tea sections. My friend Jessica, who I bumped into at a garden center, gave me two borage plants and a pair of calendula plants, which she separated from her planting packs of six. Though just four plants altogether, they exploded with dozens and dozens of the aforementioned edible flowers. Two echinacea plants rounded out the medicinal section. At one of the larger off-Island garden centers I found lemongrass and stevia seedlings, both annuals. I bought two of each to divide between the cocktail and tea sections. (Not that it really mattered which sections had what, since I could pick from any of them.) Stevia is a natural, no-calorie sweetener that usually comes packaged at the supermarket. I could now experiment myself with the sweet leaves. The lovely fragranced lemongrass, which I had once seen thrive in another Vineyard garden, is wonderful in teas and Asian dishes, and makes one hell of a simple syrup combined with ginger for cocktails. A few basil seedlings, with which I hoped to recreate that noteworthy basil gimlet offered at the Red Cat restaurant in Oak Bluffs, and one pineapple sage also went into the cocktail section. Each plant took just minutes to get into the ground. Dig the hole, mix in a little compost, tamp down the soil, water. As soon as I began planting, I realized I had a spot to sit and enjoy. One warm evening I brought out two garden rhubarb-raspberry tequila cocktails on a tray and yogurt tzatziki dip with pita bread. I pinched two sets of shapely purplish-green anise hyssop leaves to garnish the drinks. My husband and I sipped and nibbled and relaxed. As you might guess, this started a trend. elegant. The anise hyssop that received the last of my own compost was bushy and a bit out of control. I also noticed how unmistakably happy I felt each time I sat in the middle of my herb garden. The calendula flowers – like bright mini suns – kept smiling at me. The herbs stood ready to offer their services, with the power to heal, spice up or flavor foods, or offer solace. I knew there was so much more I had yet to discover, and they were here to teach me. Off my garden rocker, maybe, but with the simple act of planting an herb garden I felt welcomed into another world. There are, however, some things she says to keep in mind while planning your own herb garden. 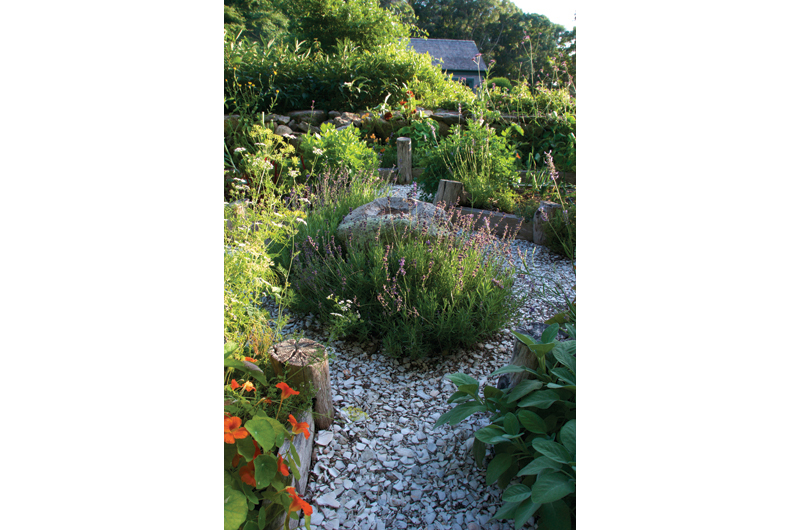 The Plot: For a perennial herb garden choose a stable section of your garden with six to eight hours of sun and room for the plants to expand. Temporary Help: If your perennial garden looks sparse, you can temporarily supplement it with annual herbs, such as basil or parsley. Plant them in between the bare spots. Consider the Container: Annual herbs, which typically don’t have large root systems, are perfect for containers on the patio or outside the kitchen, along with dill, chervil, or cilantro. “Halfway buried pottery gives a nice cottage garden accent,” she explains. They can serve dual purposes. A rosemary plant in a pot can be brought inside during winter. Mint, which is best contained anyway, can be cut back after the season and stored in a basement corner and watered maybe once a month. Final Touches: Every Oakleaf Landscape edible garden designed by Kapitan features a granite bowl, such as a birdbath, with a ring of lavender around it in the center of the garden. Another of her trademarks: placing lemon verbena plants at garden entrances. They act as aroma sentries, she says. Roxanne’s Top Herbs: Parsley, Lavender, Oregano, Tarragon, Bay leaf, Rosemary, Cilantro, Winter savory, Marjoram, and Lemongrass. After touring Christa Fischer’s tea garden on a very hot summer day, we sat down for a generously offered sample of iced lavender, chamomile, and lemon verbena tea. My lucky day. “It’s a misconception you have to dry herbs for tea,” says Fischer, who is a West Tisbury School teacher and member of the Fischer clan at Flat Point Farm. 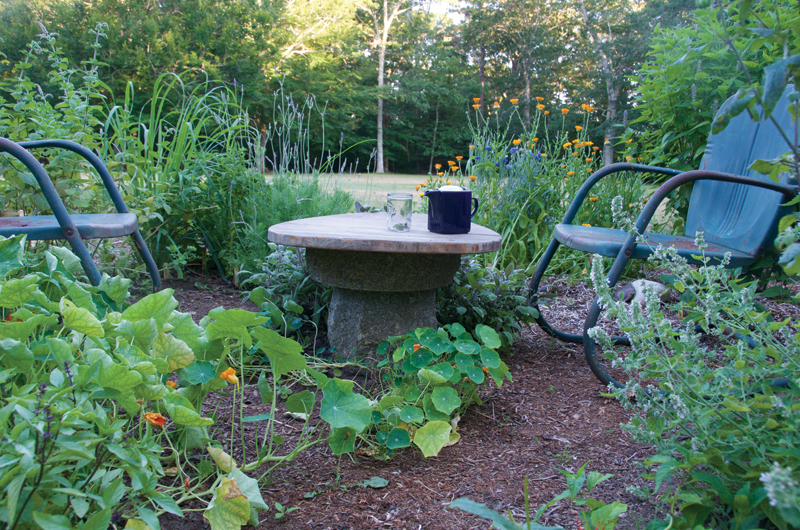 The idea for a tea-specific garden had been percolating for about a dozen years, which is how long she’s owned a book called Herbal Tea Gardens. 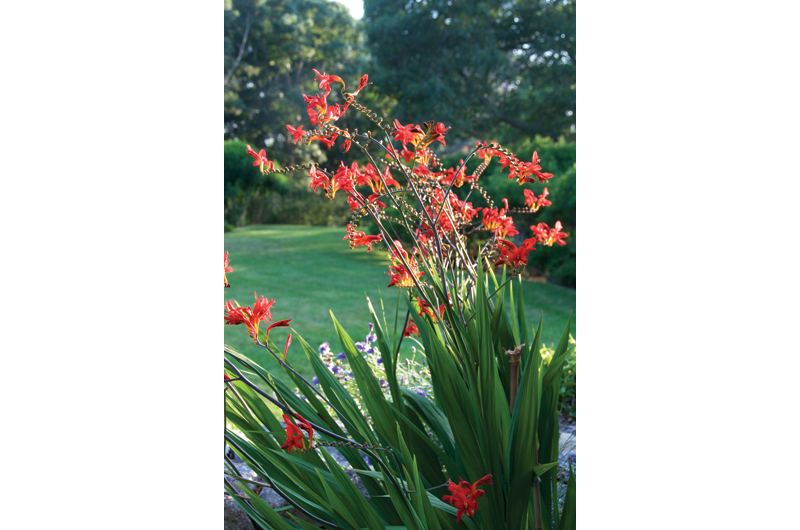 But about three years ago she noticed that a small, roughly eight-by-ten-foot garden bed sometimes used by her husband and daughter was weedy and neglected. She took it over, and with about fifteen different herbs growing – she’s always trying new ones – began to personalize teas depending on the day, mood, time of year, even ailment. The freshness adds a vibrancy you don’t always get from dried teas, she says. 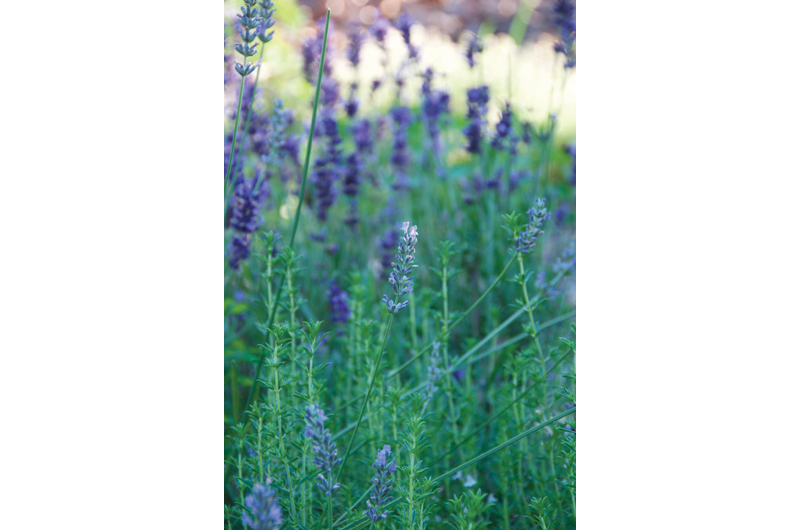 Common herbal teas like chamomile and mint have a place in this garden, as does lavender, lemon balm, pineapple mint, and lemon verbena, which when crushed gives off a fresh herbal scent of lemon. Bergamot, also known as bee balm, may be the closest to a traditional tea growing in her garden. A native American herb, it was used in colonial times as a patriotic substitute for imported tea after the passage of the Tea Act in 1773 led to widespread boycotts. The most recent additions are several varieties of saw-tooth mountain mints she found online from Tripple Brook Farm and RareFind Nursery. Strictly Medicinal Seeds is another source she has used. Christa’s Favorite Tea Herbs (“A Mixture of Calming and Refreshing”): Tulsi, Lemon balm, Lemon verbena, Chamomile, Lavender, Mint, Agastache, Hyssop, and Borage – for happiness and courage; flowers can float in your iced tea!